First, you might see if your issue is covered in the sections below. I do my best to respond to email within 24 hours. Please provide as much detail as possible (screenshots are nice) to help avoid "back and forth" emails. Please update to the latest version of RecUp to solve this issue. RecUp 3.2 and later now make use of Dropbox API v2, which is required to access Dropbox. Older versions of RecUp, which make use of the Dropbox API v1, are no longer able to access Dropbox as of February 2018. RecUp requires iOS 7 and a Dropbox account. 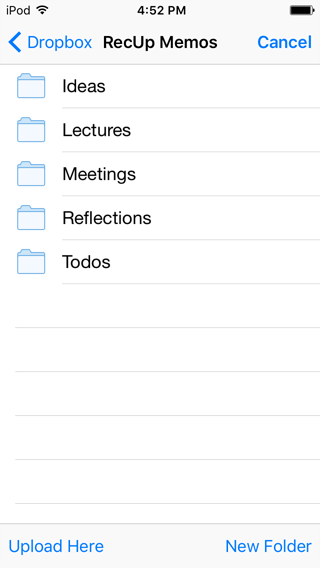 “Folder Access” gives RecUp read/write access only to files inside a special folder in /Apps/RecUp Memos. This option is more secure, but Dropbox does not allow you to invite people to share this folder. However, file and folder shared links do work. “Full Access” gives RecUp full read/write access to any file/folder inside your Dropbox. This option can raise some privacy concerns with users, but we promise RecUp will only make use of the folder /RecUp (by default). “Full Dropbox” is the only option that allows you to invite others to share your recordings folder. Which connect method should you choose? The default of “Full Access” access is right for most people. If you have security concerns, you can choose “Folder Access” instead. To connect to Dropbox using “Full Access” permissions, tap the blue button. You can always change your connection type later in the RecUp Settings. Note: You can also choose your upload folder. Tap the red button to start recording. Double-tap to pause or single-tap to stop and have the recording automatically upload to Dropbox. RecUp supports recording with the internal microphone, external microphones, wired headsets and bluetooth headsets. See more below. 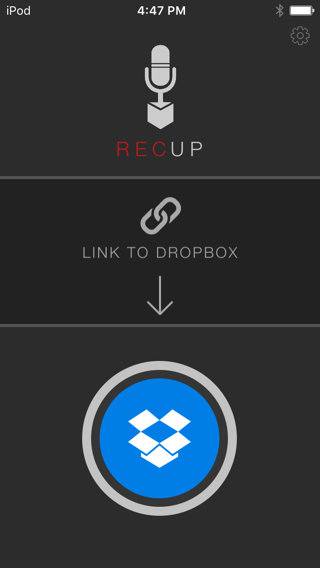 RecUp automatically uploads recordings to Dropbox when internet access is available. If an internet connection is not available, you will see “WAITING TO UPLOAD” in the upload status bar at the bottom. Don’t worry, recordings are kept on the device until they can be uploaded to Dropbox, and only removed from the device once they have been uploaded successfully. After recording, you can leave RecUp and files will be uploaded to Dropbox in the background. An indicator badge on the RecUp app icon shows how many recordings are uploading or waiting to be uploaded. Note: For large audio files, you may need to keep RecUp running in the foreground to allow the upload to complete. Otherwise, when RecUp runs in the background, it only has about 3 minutes to complete the upload. You can also retrieve recordings manually using “iTunes Access”. When this setting is on, RecUp plays a sound when a recording starts, a different sound when the recording stops or pauses, and a third sound when uploads are complete. When this setting is off, recordings are produced in 22khz mono, 40kbps MP3 format. This is a good setting for voice capture, with better-than-telephone-quality sound. When this setting is on, recordings are produced in 44khz mono, 80kbps MP3 format or 44khz stereo, 160kbps MP3 format if a stereo microphone is present. This is a good setting for high-fidelity audio, such as music. When this setting is off, pressing the power button to sleep the screen or leaving RecUp (by pressing the Home button or using the App Switcher) stops recording. When this setting is on, recording continues when you leave RecUp or press the power button. You can usually see when RecUp is recording in the background if the status bar is red. Tapping on the red status bar will return you to RecUp. Background recording comes with a few caveats, which is why it’s turned off by default. See “Best Practices” for considerations when this setting is enabled. When this setting is on, RecUp automatically starts recording upon launch, without pressing the “Record” button. Tap this button to bring up a Dropbox folder browser. You can create new folders by tapping “New Folder” in the lower right. Once you browse into the folder you want RecUp to use for new recordings, tap the “Upload Here” button in the lower left. Tap this button to disconnect RecUp from the current Dropbox account. To connect RecUp to a different Dropbox account. To change the way you’ve connected RecUp to your Dropbox account. If you have recordings waiting to be uploaded, they will remain on your device and will be uploaded once you’ve linked to Dropbox again. Turn the indicator switch for RecUp to the “off” position. If you’re using an app like Launch Center Pro, you can add integration with RecUp using our URL scheme. Select the device in the Sidebar. Scroll down and choose RecUp from the Apps list in the File Sharing section. Select the recordings you wish to transfer to your computer. Click “Save to…” and choose a destination on your hard drive. Irradiated Software, LLC shall not be held liable for data loss under any circumstances. We have made every attempt to ensure RecUp creates are safely delivers recordings to Dropbox (See “Why switch from M4A (MP4) in RecUp 1 to MP3 in RecUp 2?” below). However, RecUp is built on top of a number of systems that are outside our control, and it is possible for recordings to get corrupted or lost. This is true of ALL recorders on iOS, so we can only recommend using RecUp for short, non-essential recordings. If you are a professional we suggest using a purpose-built recording device. We don’t want you to think RecUp is unreliable; it’s just important for you to understand the potential of data loss and consider this when using RecUp (or any recorder on iOS). Making a good audio recorder for iOS is surprisingly difficult. A lot of things can go wrong, and while we’ve done our best to handle every case in our power, there are still situations that fall within your control, so here’s what you need to know. Only one app has control over audio at a time. If RecUp is recording and another app takes control, that’s called an “interruption.” When the interruption is over, it’s only possible for RecUp to resume recording if its in the foreground, which is why we caution against using the “Record in the background” setting. Receiving or making a phone call, FaceTime, etc. Receiving an alarm from events or timers. Playing audio in another app such as music, video, some games, etc. Recording in another app such as Voice Memos or Shazam. Receive and answer a phone call. => RecUp is paused. No audio can be recorded during an interruption. Phone call ends. => RecUp is shown and recording resumes. If you use “Record in the background” and receive an interruption while recording, always return to RecUp after the interruption ends to make sure recording resumes. RecUp is best for short recordings, but if you plan on longer recordings, also consider Apple’s Guidelines just below. In the Settings app, ensure that Airplane Mode is turned on, for devices that have an Airplane mode. In the Settings app, ensure that Do Not Disturb is turned on. In the Calendar app, ensure that there are no event alarms enabled during the planned recording period. In the Clock app, ensure that no clock alarms are enabled during the planned recording period. For devices that have a Silent switch (called the Ring/Silent switch on iPhone), do not move the switch during the recording. When you change to Silent mode, an iPhone may vibrate, for example, depending on user settings. Do not plug in or unplug a headset during recording. Likewise, do not dock or undock the device during recording. Do not plug the device into a power source during the recording. When an iOS device gets plugged into power, it may beep or vibrate, according to the device and to user settings. What audio file format does RecUp use? RecUp records in the highly robust and ubiquitous MP3 audio file format. See “Record in higher quality” above for specifics. Where are my recordings in Dropbox? By default, either in the /RecUp or /Apps/RecUp folder, depending on how you linked to Dropbox (see “Connecting to Dropbox” above). 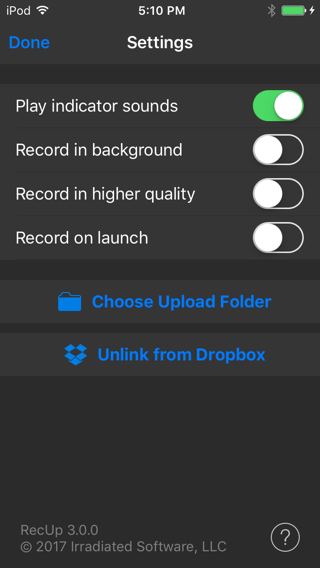 Since you can also “Choose Upload Folder” in the RecUp settings, your recordings can potentially be stored anywhere in Dropbox. Recordings are conveniently named after the current date and time ensuring they will show up in chronological order within your Dropbox folder. On any Mac or PC where Dropbox is set to sync. On your iOS device using the Dropbox app. On Mac or PC, recordings can be listened to using iTunes, QuickTime or VLC. If you’re having trouble locating your recordings, see “Where are my recordings in Dropbox?” above. Can I listen to recordings in RecUp? No, RecUp simply captures audio to Dropbox. See “How do I listen to my recordings?” above. 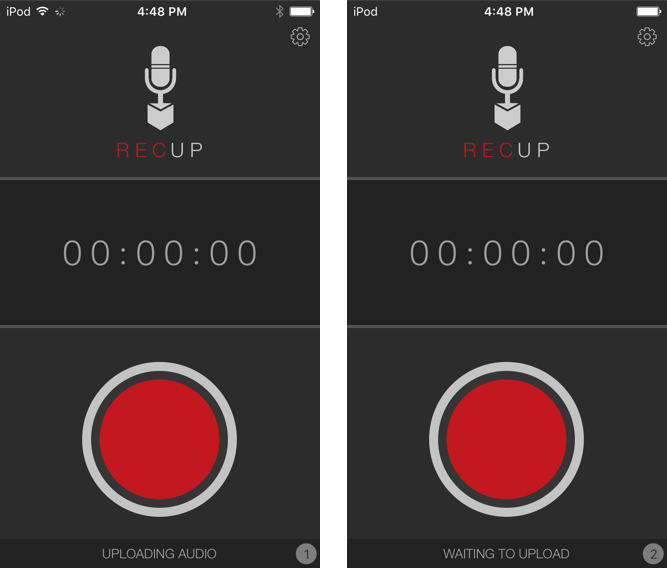 Can RecUp upload recordings made with Apple’s Voice Memos app? No, RecUp can only upload recordings it makes. What is the maximum recording length? RecUp is designed for short messages, but the only limit on the length of recordings in the available storage on your iOS device. During testing, I recorded for 99 hours without a problem. Also see “Best Practices” above. You may want to use iTunes to manually retrieve large recordings to avoid lengthy upload times. See “iTunes Access” above. Will you make RecUp for Android/Windows Mobile/My Toaster/etc.? We are looking for a developer to port RecUp to other platforms. In the meantime, a customer recommended NetMemo+ for Android. Can RecUp record phone calls? No, iOS does not allow any app to record audio while a phone call is in progress. There are apps in the App Store that claim to record phone calls. What they really do is provide a phone number that enables a three-way call. A back-end service then records the three-way call. The app itself cannot record a phone call. All communications between RecUp and Dropbox are secured with SSL, the same technology used to secure the majority of online transactions. RecUp does not encrypt recordings, so keep your device safe and prevent anyone from accessing your Dropbox account. Irradiated Software never has access to your Dropbox password or recordings; all recordings are sent directly to Dropbox. I love hearing from customers and I will certainly consider any requests. Hopefully, you’ve read “The Intention Behind RecUp” and will keep that in mind when asking. Will you add support for Google Drive/Box/OneDrive (formerly Skydrive)/etc.? There are currently no plans to do so. Does RecUp work without the Internet? An internet connection is required to initially link with Dropbox. After that, you can record online or offline. If an internet connection is not available when you create a recording, RecUp stores the files and uploads them when an internet connection is available. See also “Uploading” under Using RecUp and “iTunes Access” above. Why can I hear the indicator sounds when the mute switch is on? 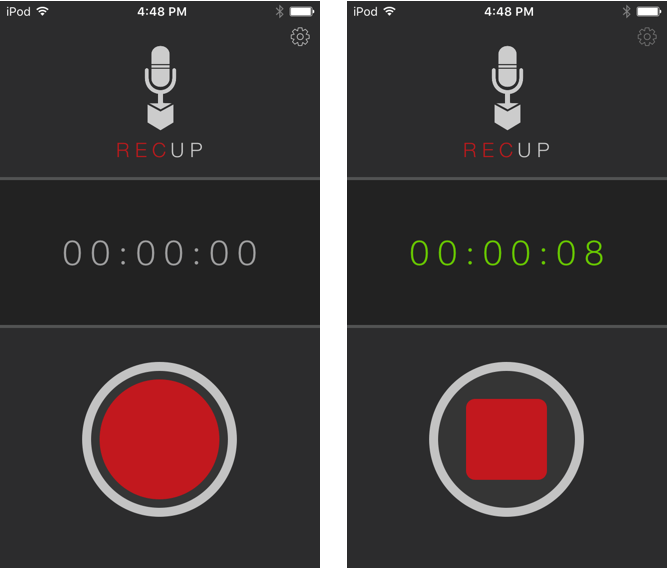 Because RecUp is an audio recorder/player, sounds that it plays are treated as audio (like music) instead of alerts (which obey the mute button). If you don’t like the indicator sounds, you can always disable them in the RecUp Settings. Does RecUp support Bluetooth headsets or external microphones? Microphones and headsets that plug into the headphone jack. Stereo microphones that plug into the 30-pin and Lightning connector. USB microphones plugged into the Lightning connector using the USB Camera Adapter. RecUp will record using the most recently connected audio input device. Otherwise, audio is recorded using the internal microphone. RecUp can handle a microphone/headset being plugged in or unplugged while recording, but doing that is not recommended. I got an “Unable to Record” error, what should I do? Sometimes RecUp can’t start recording because the microphone is being used by another app or it’s locked up. Please restart RecUp and try to record again. Open RecUp and try recording again. If neither option works, you’ll need to restart your device. Why switch from M4A (MP4) in RecUp 1 to MP3 in RecUp 2? I was distressed by the number of ways M4A files could be corrupted while recording and result in unplayable audio, which is totally unacceptable. After spending weeks trying to find and work around these corruption issues, I decided RecUp needed to switch to a more robust and corruption resistant audio file format. MP3 recordings are incredibly resilient to corruption. The upside is that MP3 files are more universal and RecUp is perhaps the most robust recorder available for iOS. The downside is that MP3 files require a slightly higher bitrate to produce similar quality to the original M4A recordings, meaning that files are about 20% larger. Also, encoding requires more CPU, which means shorter battery life. In my testing, an iPhone 4S recorded M4A for 27 hours before powering off compared to 23.5 hours for MP3.